AVIATION chatter—it’s everywhere! Spot landings. Solo flights. Aerodynamics. Ground school. Taxiing. Gliders rapidly multiplying. And above it all trills the feminine voice. If anyone doubts this, he has but to keep an ear open in places where young women gather: the luncheon halls of big office buildings, club verandas during the Saturday night dances, classrooms of high schools and colleges. It is not difficult to learn which way the thought goes. Up! 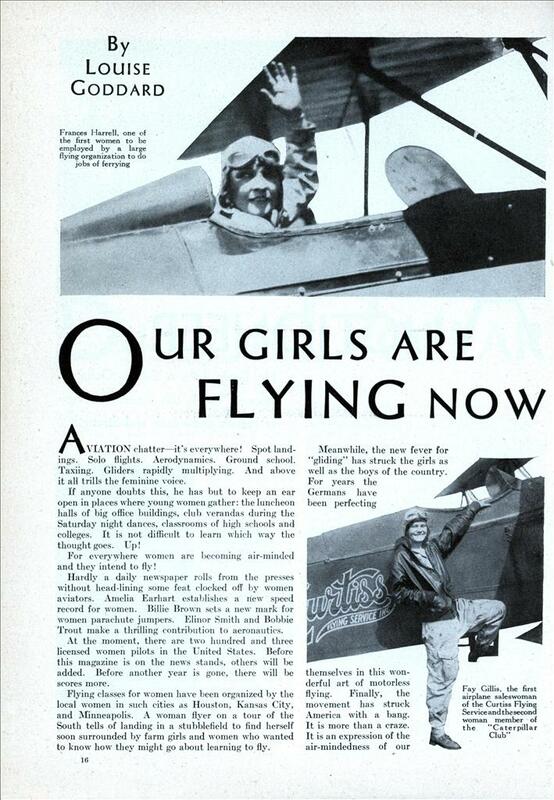 For everywhere women are becoming air-minded and they intend to fly! Hardly a daily newspaper rolls from the presses without head-lining some feat clocked off by women aviators. Amelia Earhart establishes a new speed record for women. Billie Brown sets a new mark for women parachute jumpers. Elinor Smith and Bobbie Trout make a thrilling contribution to aeronautics. At the moment, there are two hundred and three licensed women pilots in the United States. Before this magazine is on the news stands, others will be added. Before another year is gone, there will be scores more. Flying classes for women have been organized by the local women in such cities as Houston, Kansas City, and Minneapolis. A woman flyer on a tour of the South tells of landing in a stubblefield to find herself soon surrounded by farm girls and women who wanted to know how they might go about learning to fly. Meanwhile, the new fever for “gliding” has struck the girls as well as the boys of the country. For years the Germans have been perfecting themselves in this wonderful art of motorless flying. Finally, the movement has struck America with a bang. It is more than a craze. It is an expression of the air-mindedness of our young people, feminine as well as masculine. From the day that Mrs. Charles A. Lindbergh took up a glider successfully and was the first to win a woman’s glider license, girls the country over have recognized that here is both a desirable new sport for them and a means of preparation for the more ambitious occupation of flying a powered airplane. And so the feminine youth of today answers the call to become an active part of the world’s most glamorous, romantic, and fastest-growing industry. But while youth beats a path to the flying fields, the older generation, fearful for all activity outside the element it understands, is asking questions. IS AVIATION safe for our girls? Is there any future in it for them? Are the women of today, who, after all, are not so many years removed from the creature of wasp waistline that swooned at the sight of a balloon ascension, physically fit to fly? To learn the answer to some of the questions these level-headed elders are asking, I called on Roland H. Spaulding, Specialist in Aeronautical Education for New York University and the Daniel Guggenheim Fund Committee on Elementary and Secondary Aeronautical Education. Under his direction, an aviation ground school for women was opened at New York University, September 10, 1929. This was the first of its kind in the world and he also has the distinction of organizing the first course in aviation ever placed in an exclusive girls’ school in this country. Twice a week he lectures to the sub-debs at Mason Junior College and School for Girls, at Tarrytown-on-Hudson, N. Y.
I found Mr. Spaulding in his office at the Washington Square Branch of the University a half hour before class time. “Is aviation safe? You ask that question, first, because anything new is under suspicion—bath tubs were, trains, automobiles. You ask it, second, because the hazards and fatalities in aviation have received emphasis in the blazing headlines of newspapers, while the thousands of uneventful hours in the air have gone unheralded. You read of some crack-up by a student pilot, but did you read of the twelve hundred actual flying hours flown in one month by students at a prominent field without a single accident? “Here are a few figures furnished by the Aeronautical Chamber of Commerce that may interest you. Last year 52,934 Americans flew 10,472,024 miles over regular scheduled air lines and only twenty-two met death. And this mileage figure does not include the flying done by privately owned or chartered planes or in aerial service. Further, ninety per cent, of all accidents occurred during stunt flying, sightseeing, and independent flying by unlicensed pilots. He hesitated, and I was about to remind him of my second question, when he interrupted me. “You want to know what types of women have joined the aviation classes here. The same types who are going in for aviation everywhere: those who want jobs as commercial flyers; those who want positions in the business end of the industry; and, last, women of means and leisure who regard flying as wholesome sport and a real adventure. “Personally, I believe the opportunities for women as commercial pilots are not numerous at present. However, the prospects in the business end of the industry are very bright. A woman may sell planes, accessories, or flying instructions; she may become an airport hostess, editor of an aviation magazine, publicity writer or photographer for a flying field, lecturer before women’s clubs, or secretary to aviation executives. “And that brings me to your last question: Are women fit to fly? “That query is put to me daily in connection with women in aviation. My answer is yes, a woman who can pass the physical examination required by the Department of Commerce has the same chance to become a good pilot as a man. And women pass that examination every day. “However, it has been my observation that it requires a little longer for a woman to learn to operate a plane than a man. I believe this is explained by the fact that she has played fewer athletic games and indulged in fewer sports as a child than boys. For this reason, her muscular coordination and her judgment of speed and distance are somewhat inferior to a man’s. If, on the other hand, a woman has had athletic training, played games, and gone in for sports, she shows the same aptitude as a man in handling a plane. “Losing one*s head, becoming panicky in emergencies, is no more feminine than masculine, in spite of popular belief. I have seen women steady, stable, superb in emergencies. I have also seen them ‘go to pieces.’ Yet, for every case of stability or instability in women, I can recall the same number for both classifications in men. AND right here, I might say that while aviation does not need ‘nervous people,’ neither does it need stolidity. Flying a plane calls for a high degree of sensibility. A good pilot is a person well sensitized, who registers acutely, responds quickly and accurately. “When a woman enrolls for ground work here at the University, we encourage her to take the physical examination immediately, rather than wait until she is ready for flying instruction. We do this so she may be warned in advance of any physical deficiency. Often this deficiency may be overcome. If not—then the student should in all fairness know she is unfit to ‘take the air.’ “I believe that flying is a splendid builder both of health and constructive mental attitude. “The check-up made in the course of the physical examination required by the Department of Commerce stresses in a student’s mind the desirability for physical fitness and health. If a woman fails to pass the examination and the deficiency is one she may conquer, she usually goes out and does so. As a result, health is benefited. Once accepted, once having experienced the incomparable thrill of soaring in the clouds, she keeps constantly alert about her health. She does not want to lose what she has gained. The recent achievement of Amy Johnson, twenty-seven-year-old English girl, is a complete vindication of woman’s place in aviation, and certainly justifies Mr. Spaulding’s faith in their courage and ability. It is doubly impressive coming, as it did, close upon the flight of the sixty-four-year-old Duchess of Bedford, who created a new record for elapsed flying time on her trip from London to Capetown and return in twenty days, and a new record for flying between London and Karachi, India. About a month after receiving her license, Miss Johnson conceived the idea of flying to Australia, but could interest no one in the venture, with the exception of Sir Charles Wakefield, noted gasolene magnate, who supplied the gas for the trip. For eleven days she broke the record, arriving at Rangoon two days ahead of the time made by Bert Hinkler in 1928. A slight mishap in landing caused a three days’ delay and spoiled her chance of setting a new record. When she arrived at Timor, she landed twenty miles south of the regular airdome, and for a time it was feared that she was lost. From Timor she took up the most dangerous stretch of her trip—5000 miles over the shark-infested sea—and on the nineteenth day reached her objective—Port Darwin, Australia. In recognition of this feat, the King, on the Birthday List of his 65th birthday, bestowed upon her the title of Commander of the British Empire, which virtually corresponds to knighthood for a man. Miss Johnson used a de Haviland Gypsy Moth plane, which is the outstanding light sports plane of the British Empire. Mr. Spaulding then invited me to visit the classroom used for ground school. It is a hall of huge dimensions accommodating several small planes, models, and devices used in instruction. After the class, I chatted with several of the women students while they donned cover-alls preparatory to posing for a newspaper photographer. I learned that there were artists among them, secretaries, brokers’ clerks, saleswomen, women lawyers, and teachers. They were all of a high type, alert, trim, vital. Some of them take flying lessons along with their ground work, they told me, as they find that the practise with the theory clarifies the whole subject for them. One woman demonstrated for me a model which the University has installed to teach the theory of flight. Sitting in a full-size cockpit which is placed in front of a small wind tunnel, she operated the controls. A model airplane, fixed on a spindle, responded to the controls exactly as in real flying. She took the plane into ground loops, made it stall, spin. The model did not complete these revolutions but suggested them so vividly that the effect of a false move was sufficiently realistic to give the student a start. My next call was at the office of Dr. Ermin L. Ray, official Medical Examiner, Aeronautics Branch, United States Department of Commerce, who has examined hundreds of men and many women to determine if they are fit to fly. I was permitted to glance over the form supplied by the Department which covers a complete physical check-up. It included tests for eyes—color-blindness, diseases, acuity of vision, etc. ; tests for diseased conditions of ears, nose and throat: for organic troubles with particular attention to the lungs, heart, and kidneys. Tests were included for reflexes, motor disturbances, and equilibrium, as well as the nervous system in general. “Are the women you have examined on the whole as fit to fly as the men?” I asked him. “Yes,” was his prompt answer. “I have found as high a degree of physical fitness in women as I have in men. There is probably no fundamental physical difference between men and women which should make one a better flyer than the other. The best pilots are always the motor types: those types who easily translate thought into action and perform finely coordinated acts with skill. But you find motor types among women as well as among men. 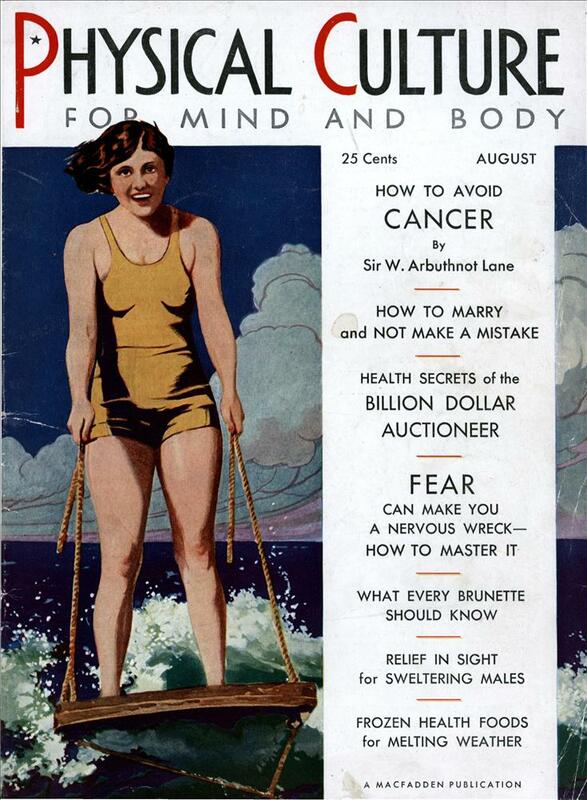 “What physical deficiency is most common in the women you have examined?” I asked him. I purposely went to new flyers instead of to Amelia Earhart, Ruth Nichols, Phoebe Omlie, or other women who have established themselves in the field, for the “slant” of these recent recruits indicates the real attitude of American women toward aviation. Frances Harrell, I chose first, because she represents that classification of women who go into aviation to make a living as a pilot. Miss Harrell is a Texan. While working as credit manager for a large furniture store in Houston, she received a sufficiently ample legacy to cover the purchase-price of a ticket to New York and flight lessons at a recognized field. Having become an able pilot, she was one of the first women to be employed by a large flying organization to do jobs of ferrying— transporting planes from one part of the country to the other. She has her eye on the transport license, the coveted goal of all serious aviators, and will stand an examination soon. “Is there a future in aviation for women?” I asked her. “Is there any reason why a woman should make a less capable pilot than a man?” I asked her. She seemed genuinely astonished at the question. I HE following day I walked into the show room of a large flying company to chat with Fay Gill is. She was my representative in class Number Two: women who find flying a stepping-stone to positions in the business end of the industry. Slim, bright-eyed, Miss Gillis is in her very early twenties. She flys like a veteran, I was told by a seasoned pilot, and also has keen business ability. This combination was responsible for her appointment as the first woman member in the sales department of the organization with which she learned to fly. Incidentally, she has designed a flying suit for women which was exhibited at the recent aviation show held at the Hotel Plaza, New York. SHE laughed brightly at the inquiry— but then Fay Gillis would, for she is the physical culture girl gone into aviation. In fact, she planned to teach calisthenics in public schools when the lure of the clouds overcame her. She excels at many sports: soccer, volley and basket-ball, and baseball. She bowls, swims, and runs. While I chatted with Miss Gillis, my eyes inevitably picked out that tiny gold caterpillar pin crinkled on her blouse. She did not tell me but I learned later that she is the second woman to qualify for membership in the Caterpillar Club—to qualify meaning to save one’s life by emergency parachute jumps. While flying in an experimental plane, she and a test pilot ‘schuted to safety when the machine was blown to pieces. Fay Gillis was born in Minneapolis and attended Michigan State College. As a representative in class Number Three—women of means, who, while not having to earn a living, go into aviation for sport—I sought the opinion of Betty Huyler Gillies, daughter of the late Frank De Klyn Huyler, president of the Huyler Candy Company. Mrs. Gillies, I found, while belonging to the group usually described by the words “of wealth,” certainly does not go in for leisure. Like Amelia Earhart, she graduated from Ogontz’ School at Rydal, Pa., and has managed to keep interested and busy since. She thought she would like nursing, but gave up her starched bonnet after having read an article by Miss Earhart on women in aviation. “Pint-size,” and barely voting age, Mrs. Gillies has already her limited commercial license. She flew to the Cleveland Air Races last August and then to Chicago. Recently she won a spot landing contest in competition with twenty men at Camden, N. J.
So—Miss New York, Miss Tulsa, or Miss Bisbee, with the questions of safety, future and fitness answered, if you really want to learn to fly, here is what you must undergo to reach your goal: Ground school such as the one described above at New York University. Flight school. A typical schedule which leads to a private pilot’s license follows, though if you are very clever, you may progress even faster than it indicates. FIRST Hour—Rear cockpit. Pilot instructor in front cockpit. Test flight. Control of elevator and ailerons. Level flight, teaching student how to hold ship on point on the horizon. Ground instruction in signals. Use of parachute. Demonstration of effect of controls. Second Hour—Rear cockpit. Stick and rudder control. Straight and level flying. Straight and normal climb. Third Hour—Rear cockpit (instructor in front cockpit). Observing instruments showing air speed, temperature, oil pressure, tachometer, banks and turns; glides to the landing field. Fourth Hour—Rear cockpit. Gliding approaches. Landing and taking off, taxiing, etc. Fifth Hour—Instructor in front cockpit. Sixth Hour—Figure eight, spiral flight. Seventh Hour—Practise on recovery from tail spins, loop, vertical banks, cutting throttle, steep turns. Eighth Hour—Emergency landings. Routine of inspection of plane and engine. Ninth Hour—General review and check for solo. Tenth and Eleventh Hours—Solo flight. Twelfth Hour—Inspection tests called check flights. Thirteenth to Seventeenth Hours—Solo flight. Eighteenth Hour—Air brakes, side slipping and check on technique, fishtail landings, spot landings. Nineteenth Hour—Solo flight. Check on Department of Commerce requirements. Twentieth Hour—Test private pilot’s license. As I put the finishing touches on this story which tells what women may do and have done in aviation, a plane hums overhead. I quit my typewriter. That droning calls me to the window more urgently than does the clang of fire engines, or the raucous jollity of a circus parade, or glittering demonstration for royalty. That gray dot up there glides, soars, sings to me. It stands for adventure, opportunity, freedom, health. I look. I listen. I thrill! For I too am young, and I want to fly! It stopped as abruptly as it had begun. Except for the pounding of her heart, she couldn’t hear anything. “It was over,” she hoped but did not dare to say. Opening her eyes once more, she saw … nothing. Nobody would believe the cacophony she had just endured. It had torn at her ears like a rabid cat. The radio no longer screamed at her. The floor no longer lurched but seemed to hum in memory of the violent shaking it had endured. The arms that had been flailing at her face were no longer visible. They had fallen away from the window that only now revealed the faintest scrapes. If it had only been a warning, it had finally changed her heart. Echoes of all the taunts came flying back. “You shouldn’t even be here,” She finally admitted. The words were barely out of his mouth when a female pilot crashed an airplane into the car. “Now who will teach me to play the piano?” wondered Eileen, who had been spared from injury… as far as she knew.